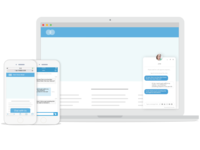 The Comm100 omnichannel customer experience platform powers real-time interactions via web, mobile, and messaging. We make it easy for organizations to answer questions, solve problems, and keep customers happy. From front-line marketing and sales to ongoing service and support, Comm100 enables great digital experiences that drive revenue without increasing costs. Comm100 Live Chat Reviews Recently Reviewed! Pros: The chat is user friendly and easy to use. It's quick and smooth. I like the custom/personal canned messages and I use them a lot. I am always informed about the down times of the servers and the software updates. The admin panel of the chat has pretty useful tools. The history and report sections are full of options and different gadgets that I use every day. Cons: I do not like that the chat agents have only 1 available theme. The old version of the chat was a lot darker and when we changed to the new chat , I had a hard time to get used with it. Now , we are not able to change that while/light theme. I would love if we have at least 1 available dark theme. Pros: I have had a very good experience with using the Com100 Live chat the past 3 years. 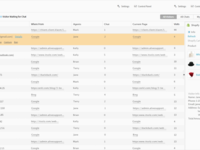 What I love most is that we can actually see the logs from previous coversations with customers which makes it easy to respond quickly to customers' queries. There are a lot of statistics options to follow the number of customers who are using the service and the workload during a certain period of time . Customer's can also rate the service and provide us with feedback which helps us ipmrove. Cons: After the release of a new version there were a few things which I did not like - such as the skin of the chat platform, some bugs and lags were appearing while chatting with the customers, however the Comm100 team managed to fix these after the provided by us feedback, so I am overall happy with the Comm100 platform. Thank you for the review and product feedback. We think our integrated chat history functionality is a great tool for faster issue resolution, and we¿re happy that you think so too. We also like hearing that our customer support team was able to resolve those issues facing your team. In addition, we are working on upgrading our UI and reviews like yours help build a case internally for this. If you have any other thoughts on what you want to see in the future from Comm100, please share them on our customer feedback forum (https://comm100.uservoice.com). Thanks again Elitsa! Pros: 1. Comm100 has no downtimes. This chat software never goes down unless your hosting solution is down. Cons: Comm100 is quite expensive. There are numerous free software out there. However, given their efficiency, I would still recommend them. Overall: COMM100 is of utmost importance if a business is serious about engaging its clients on a day to day basis. If a start-up is to effectively communicate with its clients at any one time, then this live chat software and its chatbox service cannot be ignored. At Africa Sunset Travel Solutions, COMM100 is simply indispensable despite its high monthly costs. Pros: It offers the support needed to operate our program. It is helpful to have canned messages and an after hours answering service. Cons: You do not have control (that I know of) to the tabs on the back end for reporting/sorting. So for instance, when ratings were taken off of the visible information, we needed to start opening up each chat in order to view this. Hi Jennifer, thanks for your comments. We are very sorry to hear that you've experienced some technical issues with us. We've reviewed your file and a member of our team will be reaching out to you to find out more details. For controlling the tabs on the back end for reporting/sorting, we strive to implement a system that meets the requirements of the majority of our clients. We're sorry to hear that in this case a change made has been inconvenient to you. If we understand correctly, you'd like to have a rating field on the Chats page of the control pane. Is this correct? Although this is not possible on the Chats page, you can view scores in the Rating report, or filter this over any period of time and export the data to work with it further. I hope this solution works for you - if not, please contact us at reviews@comm100.com, and we'll look into it further for you. We're always open to feedback on how our service can be improved. Thanks again for your helpful feedback. Pros: Ease of use. Most of the time its been very reliable with very little down-time. Cons: You guys should have better phone support. Normally, its only via email or chat. It would also be nice if you can offer screen shares at the basic package instead of having it as just a premium option. There are other companies that offer this. And Skype for example too has screen shares. Overall: Able to give good customer service through chat. We would like for you guys to make the icons for customers and also for us to attach files or send documents more visible and easier to access. Hi Jit, thank you for taking time to share your feedback. Our phone support time is from 9AM to 5PM PDT. If you want to talk, you can find our support team at this time period on the phone, our phone number is 1-877-305-0464. For your suggestions about screen sharing and the icons for attaching files or sending documents, we'll share them with our product and design team. We're also planning a product release with new and improved live chat button and window designs in the mid- October. By that time, the icon for customers to attach files will be changed to a paper clip. If you have any icons you like, please feel free to share them with us at reviews@comm100.com. Thanks again. Pros: Comm100 offers everything you can possibly think of needing as a chat agent . It supports as many users as needed ,provides real time data for the visitors of both the chat and your site and keeps a detailed record for each agent's performance . Cons: It currently only supports a very bright skin ,which is unpleasant to look at and can be hurtful towards the eyes .Apparently there has been work towards a richer selection ,but we haven't seen the results yet . Hi Dima, thanks for the 5 stars! We always love hearing from our customers, especially when they say "our product has everything you can possible think of needing as a chat agent". We also love getting constructive feedback as it's the key to meeting our goal of providing the best possible user experience. Regarding the agent console skin, I've shared your feedback with our product team and we are currently working on a project to improve our user interface. A great way to fast-track your ideas to our product roadmap, and cast your vote on other suggested product updates, is on our customer feedback forum (https://comm100.uservoice.com). Our development team looks at every request that is left there. Thanks again for the review Dima! Overall: It is good, strong connection 24/7, good dictionary and auto correct, good statistic and reports can be loaded, easy to manage operators, no limit of the chat accepted. Thanks so much for the 5-star review Teodora. We have worked hard to achieve industry's best up-time with our MaximumOn technology, so we're thrilled to hear that our servers have never let you down. It's also good to know that you find our product easy to use and get value from our reporting capabilities. Regarding the Agent Console brightness, this has been passed on to our product team and there are plans in the works to offer more customizability in our UI. If you have any other product suggestions, we'd love to hear about it on our customer feedback forum (https://comm100.uservoice.com). Thanks again Teodora! Pros: Real time support system to support customers. During a chat, agents can write notes or client information so that if the customer comes back to chat in the future, a history is already there. Cons: It will be nice to have an auto-log out if agent has been idle for more than 30 mins. Also, maybe a alarm reminder if the client the agent is chatting with has not replied for more than 2 mins. inquiries. Regarding auto-log out, you can set this up in our desktop version (Please go to https://www.comm100.com/livechat/download.aspx to download.) As for the alarm reminder, you can set up a similar function through automatically stopping chats if visitors go inactive. Please refer to this article https://www.comm100.com/livechat/knowledgebase/set-up-a-timer-to-automatically-stop-chats-if-visitors-have-been-inactive.html for details. If you would like to have a specific alarm on agent side, you are always welcome to leave your thoughts in our Feedback Forum (https://comm100.uservoice.com/). We always appreciate any ideas to help us make our product better for you, and our team consider every suggestion left. Thank you again for your review! I find that Comm100 tends to have sporadically. Pros: I love the features it has and the abilities that you have to customize it. I also like the many reports that you have to choose from. Cons: The glitches. Sometimes the window freezes, sometimes my responses are delayed to our customers, also sometimes they don't see my responses at all. 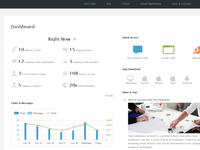 Overall: It helps me assist multiple customers at a time. Hi Sharlea, thanks for your comments. We're glad that you love the features of our chat system, but we're sorry to hear that you have been experiencing some glitches. We've reviewed your account, and noticed that you are using an outdated version of our Agent Console app, which can cause the issues you're experiencing. We have since switched to a more reliable HTML5 based technology, and if you can upgrade to the latest version, that will stop the issues you describe from reoccurring. 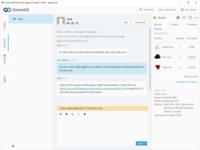 You can upgrade to our new Agent Console by uninstalling the old app and installing the new one from https://www.comm100.com/livechat/desktopchat.aspx. We'll arrange for a member of our team to reach out to you to follow up and make sure that you've seen an improvement once you've done this. Thanks again for your helpful feedback. Love this product! Everything is readily available for your use in the desktop and web application. Pros: I can see what a client is typing prior to receiving the direct response which allows me to begin research and fast response times. Cons: With all the updates, it looks the ability to keep track of how long a person is waiting in the chat is not present anymore. This helps my team as we have a certain amount of minutes in the middle of each response to get back or check up on clients. 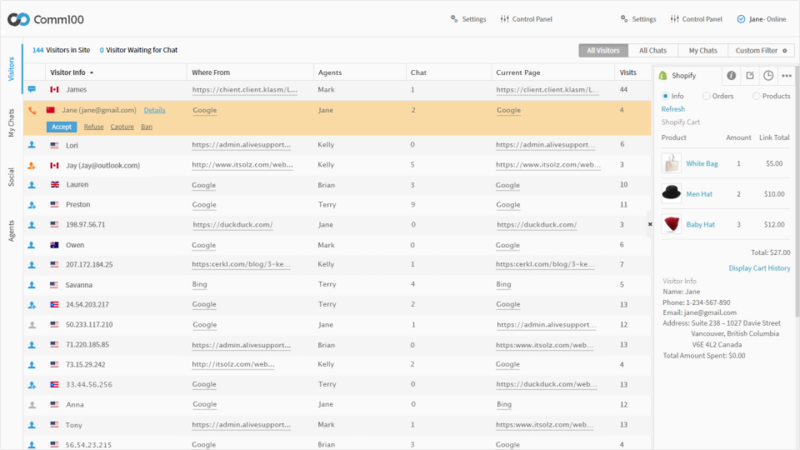 Overall: Ability to monitor all incoming chats from clients regardless of the operator. Hi Carmen, thank you for your feedback about our product. We are glad to hear that both the desktop and web version work well for you. It is also good to know that you are finding it useful to view messages before they are sent. In terms of why you are not able to view how long a person is waiting in chat, please check the bottom left of your Agent Console interface where there should be a Settings icon and tick 'Show agent unresponsive time' to enable the wait time display. If you have problem fixing this, please feel free to contact our customer support team via live chat for more detailed guidance. Thank you again for the feedback! Comm100 has helped us streamline our chat and provide better support. Pros: The ability to monitor all chats for the supervisors is incredibly helpful to make sure all of our agents are giving the most accurate information while remaining friendly. Cons: The inability to send messages as a supervisor in a chat being handled by another agent. Sending them directly to the agent means they are often missed. Hi Erica, thank you for sharing your experience with us. Happy to hear that our live chat helps you provide better support. We understand that sometimes chats require management involvement. Sending messages as a supervisor in a chat is good, but the visitor might feel like a message from a stranger appears out of the blue. A suggestion is to use the Join Chat feature so that the visitor knows another person is joining the chat. Upon entering the chat conversation, you can introduce yourself, and address the case over chat. Hope this helps. If not, please contact our support team at support@comm100.com, or chat with us online so that we can discuss further and better meet your needs. Pros: Live chat works just as expected, never seen it fail. Easy to transfer chat to another operator, easy to setup and use canned questions. Cons: I'm not sure how tickets are re-opened (after they are closed) with just an email reply (some times even weeks ago). Overall: It solves the live-chat problem, together with a ticketing system. We use the ticket system to track requests for fixing our web-application, which saves us money from buying software such as Jira. Hi Ethan, thanks for the detailed comments. We're glad that you like our live chat system. Regarding the tickets re-opening, as long as there is an email reply to the closed ticket, it will be re-opened, and its status will be changed to Pending Internal. This is to make sure that any further messages will not be missed, and will be attached to the same ticket to understand the context better. We hope this solves your issue, but if not, please reach out to our support team to see how we can help you further. They can be reached at support@comm100.com or you can chat with us online, any time. Also, we're actually redesigning our ticketing system right now, aiming to make it more straightforward and intuitive. Please stay tuned! Customer Service is abominable and needs improvement, massively. Pros: When it works, fast and efficient. It also looks nice from user perspective. The canned responses are easy to navigate to. Cons: It glitches, which makes us look less assertive towards our customers. Chat wrap ups could be more effective and people being allowed to leave low ratings when they leave chat due to inactivity is unfair for our internal satisfaction evaluations. Hi Lucy, thanks for sharing your experiences. We're so sorry to hear that you haven't been happy with our service. We reviewed your account, and noticed that you're using an outdated version of our Agent Console app, which can cause the issues you're experiencing. We've since switched to a more reliable HTML5 based technology, and if you can upgrade to the latest version, that will stop the issues you describe from reoccurring. 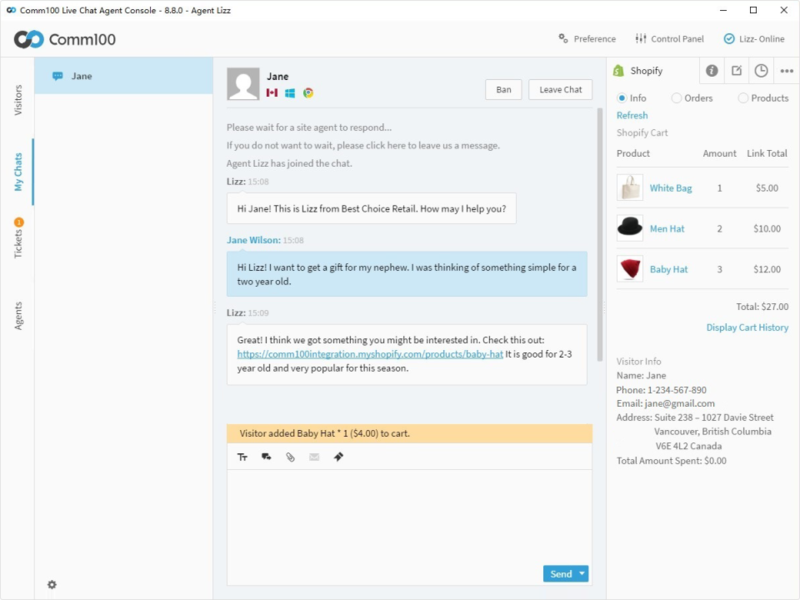 You can upgrade to our new Agent Console by uninstalling the old app and installing the new one from https://www.comm100.com/livechat/desktopchat.aspx. We'll arrange for a member of our team to reach out to you to follow up and make sure that you've seen an improvement once you've done this, and also discuss the chat wrap up changes you'd like to see. We hope in future the service you receive meets or preferably exceeds your expectations. I would urge you to contact us at reviews@comm100.com if that is ever not the case. Thanks again for your helpful feedback. Pros: The usability feature is excellent, I started with 1 person in my company and did POC for this software and management was pretty impressed with the features and ease of use. There are definitely excellent tools in the market for chat support but for us Comm100 worked the best. We have expanded it to our intranet, agents and customers for communication. Cons: I would be happy to see if comm100 can come up with reporting feature that has automatic scheduling to be sent via email to required set of people. Hi Smita, thanks for leaving us a 5-star rating! We're glad that you enjoy using our live chat product. As for emailing scheduled reports, we already have this feature on our roadmap and will incorporate it into our product in a future release. Please stay tuned. Thanks again for your review and suggestions! Pros: Comm100 is in my opinion the best software for a live chat system both customer service agents and customer alike. It's easy to use on both sides. 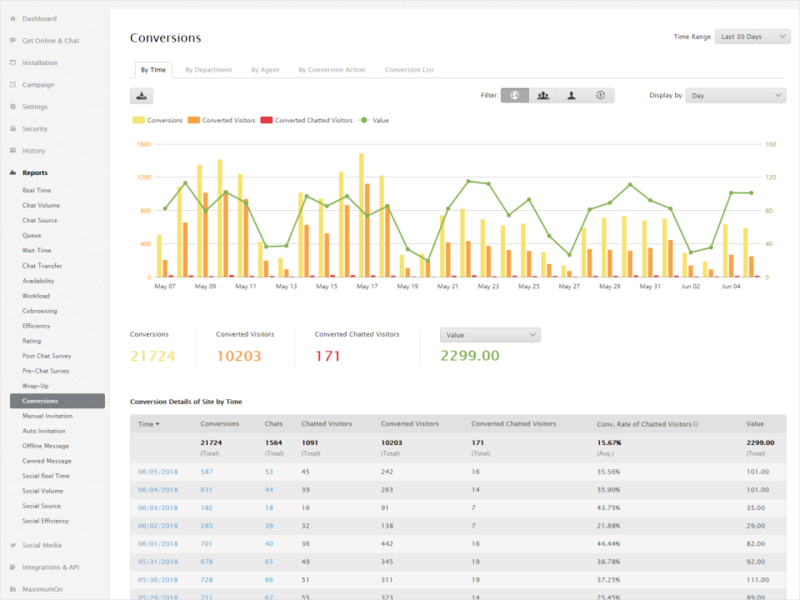 As an agent using this software daily I find it extremely helpful to track and manage all records of previous chats. The features for canned messages and daily stats are amazing. Cons: I would like to have options for customisation for the look of the panel from the agent's side. thanks so much for the 5 star review!. Hearing that our customers are getting great value from our product is so important to us. I will be sure to pass on your note that we are best live chat system to our development team as well as your feedback on UI customizability. Please leave any future product ideas on our customer feedback forum (https://comm100.uservoice.com). Thanks again for the review! Pros: the simplicity for the user coming into chats, the reports the software gives and the ability to send attachments in the chat. Cons: It can be slow to accept the chat, and missed chat reports are not accurate. It should not include users who have requested to chat and change their mind within 5 seconds. It reflects badly on a reports. Hi Olivia, thank you for sharing your experience here. We're glad that you enjoy our live chat product. We apologize for the slowness in accepting chats. A member of our support team will reach out to you to follow up on this. Regarding the missing chat report, we strive to implement a system that meets the requirements of the majority of our clients. We're sorry to hear that in this case this has been inconvenient to you. However, we'll definitely send your feedback to our product team. Thanks again! Pros: Easy to get up and running and customize. Easy to manage multiple interactions. Switching between devices or refreshing browser doesn't lose session. Cons: When there are problems it can be a bit of a blackbox. No real troubleshooting tools. Can't monitor chats on the mobile app. Overall: Easy interaction with customers. Hi Drew, thank you for taking time to leave us detailed comments. Glad to hear that you find our live chat product easy to use. Regarding the troubleshooting tools, may I know what kind of tools you'd like to have and the issues you run into? It would be great if you could contact our support team for suggestions and for troubleshooting. They can be reached at support@comm100.com, or you can chat with us online. For monitoring chats on the mobile app, we'll send it to our product team as feedback for future improvement. Thank you. Cons: design- view adjustments for users` need more options so that user can adjust to his preferences - especially eye - color , brightness , spell check , fonts customization . Hi Reni, thank you for leaving us a 5-star rating, it's great to hear you're finding out feature set useful. Regarding the design view adjustments you mentioned, I have sent them on to our product team for future consideration. Meanwhile, you are always welcome to leave any feature requests or product feedback at our Feedback Forum (https://comm100.uservoice.com/). Your ideas are fantastic for our product team to help develop the product that our customers want. Thank you again for your review! Does an excellent job allowing our company to provide online support. Pros: Allows our customers to come out to a live chat for quick questions or remote sessions. It also allows us to speak with potential customers interested in our software. Overall: I am a sales rep and I have received many leads from potential customers selecting to ask questions via the live chat option. Hi Amanda, thank you for taking the time to leave us a review! Yes, getting questions addressed on the spot can definitely turn more casual website visitors into happy customers, and we're so pleased that you have received many leads from live chat. We really appreciate your custom and thoughts about our product, so if you ever have any feature requests or want to make a suggestion in the future, we now have a public feedback community that you can use for this (https://comm100.uservoice.com/). Our product team monitors this community regularly. Any comments you have will be very gratefully received, as they help us to stay connected to what our customers want and to keep improving our product. Thanks again for your review, Amanda! Pros: Pros: Great visual for use, Always know when there is someone who is trying to chat with you by the pop up and the icon that glows. The information of how many people are using the web page that your chat is associated with. Also the reporting tool is great and also being able to check your other livechat users who are logged in and out and are in a chat. 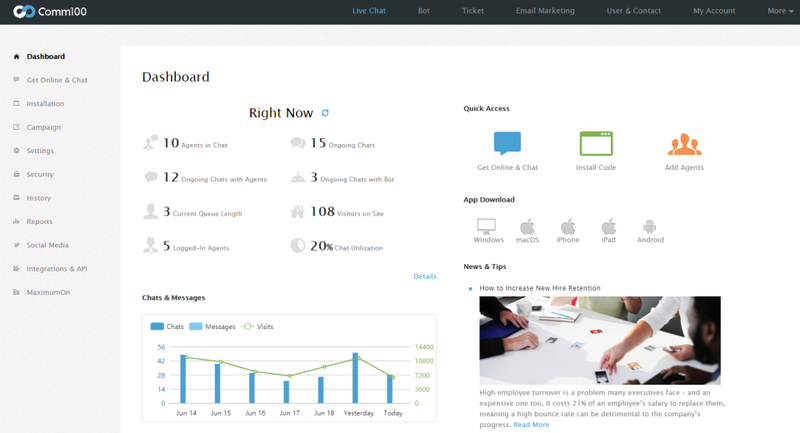 Also provides the feature for the user to chose to email or livechat in real time. Overall: Ease of use, and also great record keeping. 5 Star Chat Platform ! Pros: Great chat platform with a cloud storage ,so you don't have to worry if something goes wrong on your side . Has more features than I could count.The company regularly issues out help materials on their site . Cons: Can be too bright on the eyes . It takes a while until you get accustomed to the program and can navigate easily .Other than that ,it`s wonderful . Hi Steven, thank you for leaving us a 5-star rating! We're happy that you like our live chat. Regarding your feedback about the brightness of the system, I have already sent it to our product team for improvement. For any other suggestions down the road, we now have a public feedback community (https://comm100.uservoice.com/) for our clients to send in feature requests or suggestions. Our product team monitors this community regularly and your participation there will be hugely appreciated, as we are always looking for ways to improve our product for our customers. Thank you again! Pros: I like how easy is working with it, very functiona, fast, simple design that helps you oriented where everything is. Cons: There aren't any options for customization of the themes and the fact that the mantainance of the site isn't announced upwards. Hi there, thank you for leaving us a review. We're happy that you find our live chat fast, functional, and easy to use. For adding more customization options, we have a public feedback community (https://comm100.uservoice.com/) for our clients to send in feature requests or suggestions. If you could let us know there what you'd like to see, we'd be happy to review your comments. Our product team are on this community and we'd love to hear more so we can take your ideas into account to help change our product for the better in future. In terms of your comments around our maintenance announcements, please could you double check whether these emails landed in your junk folder? We always send announcements before any period of scheduled downtime, usually 3 days before maintenance begins. You can also contact our support team (support@comm100.com) and give us your email address for us to check what's been happening with those emails. We'd be very happy to look into that for you. Thanks! Pros: I enjoy using this digital conversation platform s it allows me a combination of mobile, web and messaging. The support of this software is pretty good. Cons: A drawback is that only one theme is available. Also, it would be nice to have an ability to provide a direct feedback. Hi Gene, 5 stars across the board ¿ you're going to make us blush! Great to hear that you appreciate Comm100's mobile optimization, multichannel support, and customer service. As for the agent console theme, we are currently working on improving our user interface and I have shared your note with the product team who will consider it for our product roadmap. Regarding direct feedback, you can always share your suggestions for Comm100 on our customer feedback forum (https://comm100.uservoice.com). We are always looking to improve, so please share any thoughts you have on our product with us. Thanks for the great review Gene! Thanks to comm100 to provide awesome features with the great support. Pros: We have tested almost 15 to 20 software before selecting the comm100. The features which were looking and our expectation meet only through comm100. So thanks again to provide great The most which like fast chat response over the chat software with our end users and we can see what they type before getting at our end. A huge thank you for taking time to rate us, Hitesh! Glad that you love our live chat software and customer support. And yes, being able to see what the end users are typing can help you understand the visitor's state of mind and better prepare an answer. If you have any questions, or would like to make a suggestion, please feel free to let us know. Thanks. I have a fine time using this program. It is easy to customize the settings as well. Pros: I like that I can adjust the settings to my liking. I also like that when changes are mad we get an updated email telling us about the changes. Cons: I have not come across anything that I do not like yet. But maybe I would say that sometimes I get kicked out of the program and am not aware immediately. Thank you for your kind feedback, Syisha. We are glad that you like our live chat solution. Regarding the issue of getting kicked out without being aware immediately, our support team would definitely like to get this fixed for you. Would it be possible for you to email them at support@comm100.com, or chat with us online? We will then be able to look into how to get this resolved for you. Thanks. Hi Georgi, thank you for your review. We're glad that you find our live chat user friendly and that your customers love using it. Regarding your feedback about the brightness of the system, I have already sent it to our product team for improvement. For any other suggestions down the road, we now have a public feedback community you can participate in (https://comm100.uservoice.com/). Thank you again for your review! Pros: The product is super easy to setup and use. It provides a seamless interface to our clients allowing them to get help with little or no effort. Cons: I really don't have a con, if I had to pick one it would be nice to have a few more choices for how the chat button floats on the page. Hi Gary, thanks for the review. We are very excited to tell you that we're planning a product release with new and improved live chat button designs in the mid-October. One of the new designs we'll add is another type of floating chat button. It also has an interactive animation that's designed to be modern and eye-catching without being too heavily animated or distracting. Please stay tuned! I am satisfied with my Comm100 experience. Pros: It's simple presentation is easy to work with. The customer service has been exceptional as well. Cons: I would like to see all the Comm100 website features integrated into the Comm100 app, if possible. I'd like the layout of the Comm100 app to mirror the website layout. The app feels somewhat limited. Hi James, thank you for your review! We're happy that you like our live chat product and customer service. Regarding the Comm100 website and app, are you talking about the web app and mobile apps of our live chat? We have a different mobile-optimized layout to make sure our system is easy to navigate and use on mobile devices and are sorry to hear that this currently removes some features and functionality that you would like to use from our web and desktop app. The good news is that improving our mobile apps is always on our minds and we'll definitely incorporate more features into our mobile apps in the future. For specific mobile feature requests you can participate in our public feedback community here: https://comm100.uservoice.com/. Thanks again! Cons: Not enough customisation available as for the look/Colorado scheme of the chat on both sides as well. Hi there, thanks for leaving us a review. We're happy that you find our live chat user friendly and full of functionality. Regarding adding more customization options, we now have a public feedback community (https://comm100.uservoice.com/) for our clients to send in feature requests or suggestions. If you could let us know what kinds of customization options would help you, our team would be very happy to review your comments. Our product team are on this community and would love to hear what you think, as it allows us to improve our product for the better in the future. Thanks again! User-friendly interface, could use some performance improvements. Pros: Enjoying the functionality in general - features such as personalized canned messages, details of customers in chat as well as the navigation. Cons: Design could be revisited in regards to the brightness. Performance is a matter that can be reviewed as well, due to slight issues popping up occasionally. Hi Victor, thank you for leaving us a 5-star rating! We're happy that you enjoy using our live chat. Sorry to hear the issues you're experiencing. In terms of your issues with performance, our team would love to look into this for you, but we'll need some more information about the specifics of the issue to start investigating. Would it be possible for you to email them at support@comm100.com, or chat with us online? We'll also arrange for a member of our team to reach out to you, just in case you don't see this message. Thank you again, Victor! Good tool to interact with customers. Pros: Ease of use . It is easy to learn and navigate. On demand interaction with customers. Cons: Sometimes the rating data goes missing which makes it hard to keep track. Can lag sometimes which is annoying. Doesn't provide enough data for analysis . Hi Abdulrahman, thanks for the review. We're sorry to hear you've been having a few issues. We have reviewed your account, and noticed that you are using an outdated version of our Agent Console app, which can cause the issues you're experiencing. We have since switched to a more reliable HTML5 based technology, and if you can upgrade to the latest version, that will stop the issues you describe from reoccurring. You can upgrade to our new Agent Console by uninstalling the old app and installing the new one from https://www.comm100.com/livechat/desktopchat.aspx. Regarding data for analysis, our team can help with this once we understand the data you need. They can be reached at support@comm100.com or you can chat with them via the chat on our website. Thank you. Pros: The system is easy to use, the interface looks good and has a lot of functions that you cannot find or are not so well thought anywhere else. Cons: Based on my experience with the software I don't see any immediate cons. Maybe a little more variety on the customization for appearance would be good. Overall: I am able to work more efficiently thanks to this system. Hi there, thank you for taking time to write us a review. We're glad that you like our live chat and that it has helped you to work more efficiently. Regarding having more variety in appearance customizations, we now have a public feedback community (https://comm100.uservoice.com/) for our clients to send in feature requests or suggestions. If you could post there about the customizations you'd like to see, our team will be pleased to review your suggestions. Our product team monitors this community regularly and your participation there will certainly be appreciated, as we are always looking for ways to improve our product for our customers. Thank you again! Pros: I love using the quick canned message feature. It allows me to respond quickly with a lot of commonly used statements. Cons: When a new message come through I get a pop up in the lower corner of my screen if I have the window minimized. That pop up goes away too quickly for me to click on it. There needs to be an option to have that pop up appear longer. Hi Michael, thanks for taking the time to leave us a review! We're happy that you love using our canned message feature. For your suggestion to have the pop-up notification stay longer, I've already send this feature request to our product team for further improvement. For any other suggestions down the road, we now have a public feedback community you can participate in (https://comm100.uservoice.com/)Thank you again for your review! Pros: Pretty usefull to communicate with on site customer , as I sell car thru my website, its a tool I definetaly need! Cons: Well , the only thing would be some bug with the ios version. Something the app just close by itself. Hi Maxime, thank you for taking the time to leave us a 5-star review! We truly appreciate our long-term business partnerships such as this one. We apologize for the issue on the iOS version. A member of our support team will reach out to follow up the issue. Thank you again! I use the program daily and find it very intuitive. Pros: The simplistic design allows for clear and easy access. I am able to navigate quickly as well as manage multiple guests at once. Cons: My least favorite part is that I am unable to deselect a visitor after had looking at their details and information. Thank you for sharing your experience with us. If you don't want to have any visitor selected, you can select an out-of-site visitor. So once the out-of-site visitor disappears from your agent console, no visitor will be selected. We'll also send this feedback to our product team. Hope this helps. If you need further help, please don't hesitate to contact our support team at support@comm100.com, or chat with us online. Thanks again. I enjoy Comm100 it is easy to use and great wait to stay in touch with customers. Pros: I like the ease of navigation. I also enjoy the canned response, this saves time on typing and being able to respond to customers easily. Cons: I don't like the fact that my reps have no way of recalling last chats, due to sometimes they have to reach back out to customers and forget to write down information. Hi Tinesha, thanks for providing such detailed comments. We're happy to hear that you enjoy the navigation and canned response features. For recalling last chats, we would like to hear more details to better understand your needs here to see how we can help. We'll arrange for a member of our team to reach out to you to get more details. Thank you again! Pros: I use Comm100 Live Chat daily for work and I have never run into any issues or problems with this program. It's an incredibly helpful tool to communicate with our clients and, overall, it is a great program that is easy to use and very convenient. Hi Pascale thank you for your nice review and leaving us a 5-star rating. We're happy that you like our live chat. Meanwhile, if you have any feature requests or product feedback in the future, you can always leave them at our Feedback Forum (https://comm100.uservoice.com/). Your ideas are very important for our product team to help develop the product that our customers want. Thank you again for your review! Have used for a number of years and more recently upgraded to start using the departments feature. Pros: Ease of use, responses from support team, department feature and smart phone app. It easily integrates to our websites and we use it across multiple sites. Hi Richard, thanks for leaving us a 5-star rating! If you ever have any questions, or would like to make a suggestion for a future feature, please feel free to let us know. Thanks again. Pros: This is an easy product to use. You can check how many people are online, how many chats are needed, also can see who is in a chat and monitor if you have the permissions. Sends an email to you and to the customer if they chose for audit purposes. Cons: Not too many to mention, though the email us feature if you are able to send from the livechat box it would be great if it defaulted to your companies email versus changing it, though It could be a company it process. Overall: Easy convenient, another way to assist customers with their every day business. Not bad, overall it is quite good and easy to use. Pros: Easy to use, no problem chatting with multiple customers. The translate feature is quite good and easy to use. Hi Petar, thank you for your review. We're glad that you like our auto translation feature. Sorry to hear you're having issues with brightness, freezes and canned messages. It sounds like you may be using an outdated version of our Agent Console app, as this can cause the issues you're experiencing. We have since switched to a more reliable HTML5 based technology, and you can upgrade to the latest version by uninstalling the old app and installing the new one from https://www.comm100.com/livechat/desktopchat.aspx. We'll also arrange for a member of our team to reach out to you to follow up. Thank you again, Petar! Pros: Easy to use! It's very easy to receive and respond to chat messages, as well as message other agents directly in the application. Cons: A little difficult to send email messages between agents. A couple times an agent has tried to email me a chat transcript but I never received it. Hi Tessa, thanks for leaving a 5-star rating! We're glad that you enjoy using our live chat software. Regarding the instances where you were unable to receive a chat transcript, is it possible that they landed in your junk folder? A member of our support team will reach out to you to follow up the issue. Thank you again for your review. Pros: All of the information is at your fingertips, easy to use and navigate to transcripts and other historical information. Hi Raymond, thanks for leaving us a 5-star rating! We're happy that you find our live chat product intuitive and easy to use. We now have a public feedback community (https://comm100.uservoice.com/) for you and other clients to send feature requests or issues. Our product team monitors this community regularly and your participation there will certainly be heard to help us as we are always looking for ways to improve our product for customers. I use livechat to communicate with external clients. Pros: I enjoy the ability to manage multiple chats at the same time. I also like how notifications allow me to know if there is a new participant. Cons: The menu system could use some refinement. It would also be very helpful to have the ability to insert screenshots. Overall: It allows me to communicate with clients. Hi Joshua, thanks for your review. We're happy to hear that you are enjoying the ability to manage multiple concurrent chats and receive real-time live chat notification. Regarding the menu system, we've already sent your feedback to our product team for further improvement. For any other suggestions down the road, we now have a public feedback community (https://comm100.uservoice.com/) for our clients, such as you, to send feature requests or file bugs. If you have any specific suggestions to help us refine the menu system or have other feature request, please feel free to contribute there. As for the ability to insert screenshots, are you talking about sending screenshots during a chat session? If so, it can be done through a quick drag-and-drop. You can contact our support team at support@comm100.com, or chat with us online for a member of our team to walk you through this capability. Thanks again. Hi Tori, thanks for your comments. Regarding the degree of customization available, if you wanted to collect a customer's phone number, you could either add this as a requirement into a pre-chat survey so they can type it in themselves, or you could even add a custom wrap-up field for your agents to collate this information. We hope this helps, but if you would like any help with this, please don't hesitate to contact our support team at support@comm100.com, or chat with us online. Thank you. Comm100 Live Chat is incredibly easy to use! I love that I can search the history of chats. Pros: It is simple and easy to use. I like having access to the history of chats, as well as quick to identify team member on chat. Overall: It's another tool we utilize to access a larger customer base and provide excellent customer service. Luckily this program is super easy to navigate around. Hi Jessica, thank you for taking time to write us a review! We're thrilled to hear you enjoy using our live chat product, and that our live chat helps you provide excellent customer service. If you have any questions, and want to make a suggestion, please don't hesitate to let us know. Thank you again! Pros: Anything you can think of in a chat client , Comm100 can provide . I like the super detailed reports you can get about customer behavior in the chat ,which enables you to get the maximum from your conversations . Cons: Would love for more variety in skins .Otherwise it's perfect . We very much appreciate the review and the kind words. 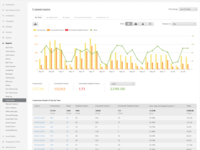 We are happy that you are finding value from our reporting and analytics functionality. As for more agent skin variety, I will make sure this feedback gets to the right people on our product team. If you have any other thoughts to share on the product, please tell us over at our customer feedback forum (https://comm100.uservoice.com). Thanks again Tihomir!